The Museum of Connecticut History in Hartford focuses on Connecticut's industrial, military, and political history. Both changing and permanent exhibitions illustrate the state's growth and the part it has played in the development of the United States from colonial times to the present. 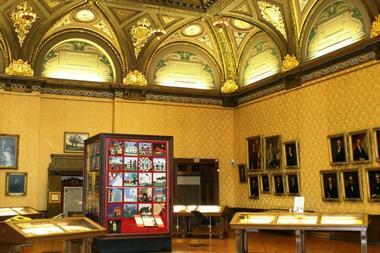 The museum itself is made up of Memorial Hall and an additional 3 adjoining exhibition areas. 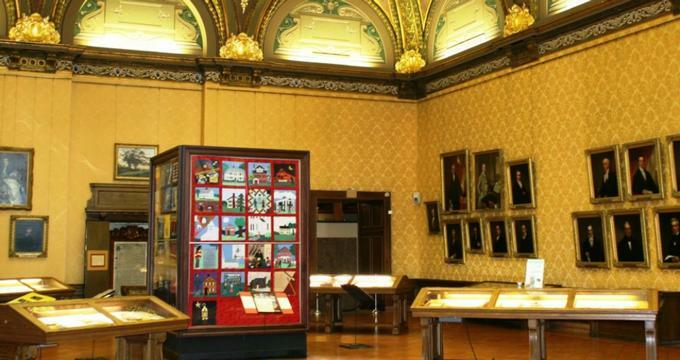 Among the permanent displays are historic documents, such as the 1818 and 1964 State Constitutions and Connecticut's original 1662 Royal Charts, and portraits of Connecticut governors. The Museum of Connecticut History has been collecting and displaying items related to the state's military, industrial, and political history since 1910. The museum is situated inside the historic and beautifully restored 1910 State Library and Supreme Court building in Hartford, which is located across the street from the State Capitol building. Visitors can find portraits of 72 of Connecticut's governors along the walls in the Memorial Hall. The portraits include that of John Haynes, Connecticut's first governor, as well as Jonathan Trumbull, the state's governor during the American Revolution. Portraits of William Buckingham, governor during the Civil War, and Ella Grasso, Connecticut's first female governor, are also on display. A portrait of John Rowland, governor from 1995 to 2004, is the most recent addition to the museum's portrait collection. Connecticut's constitutional government history dates back to 2 important documents in the 17th century: the 1639 Fundamental Orders, which created a colony by binding the towns of Windsor, Wethersfield, and Hartford together; and the Royal Charter of 1662. The Liberties and Legends exhibit tells the story of the "Charter Oak" and its impact on the history of Connecticut. The Charter Oak legend plays an important role in Connecticut's history of constitutional government. A "Royal Charter" was granted to the Connecticut colonists by King Charles II of England in 1662. This charter gave the colonists rights which were unique to the newly founded colony. However, James II ordered agents to seize the "Royal Charter" 25 years later. The document was hid by spirited colonist in a grand oak that was located on the Wylls estate in the town of Hartford, thus preserving the charter and also the rights of the colonists. The oak tree then named the Charter Oak, and became a state landmark for more than 150 years until it sadly fell in 1856 during a storm. Acorns, twigs, branches, lumber, and leaves were collected from the toppled oak as keepsakes. The exhibit also showcases several souvenirs that are made of wood from the original Charter Oak, such as picture frames, miniature furniture, and a Colt revolver. The original Royal Charter, on display in the exhibit, is preserved in an ornate wooden frame created from wood from the Charter Oak. Several "descendants" of the Charter Oak can be found on the State Capitol's grounds and in Bushnell Park in Hartford. The Connecticut Collections exhibition showcases items representing the industrial, political, and military history of Connecticut. Items representing the state's early governance include Connecticut's original manuscripts of the Declaration of Independence, as well as the original manuscripts of the United States Constitution and the Articles of Confederation. 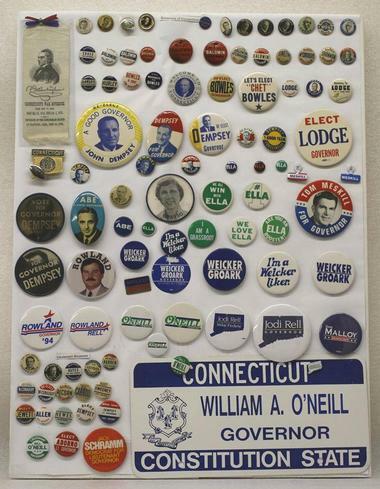 The exhibit also contains political buttons, signs, an early 20th century voting booth, and women's suffrage banners. Personal mementos and historic photographs connected to prominent Connecticut political figures are also on display at the Museum of Connecticut History, including a photograph of the legendary showman P.T. Barnum, who served as mayor of Bridgeport and several terms in the State Legislature. The collection also includes objects representing Connecticut's military history and its contribution to American war efforts dating back to the colonial wars all the way to Operation Desert Storm, such as flags, uniforms, weapons, portraits, and memorabilia. Among the Civil War display are weapons, uniforms, and an original diary and other mementos of Connecticut soldiers in the Andersonville prison. Equipment and service uniforms from the Spanish-American conflict, World War I, World War II, Vietnam, and the Persian Gulf War are also on display in the exhibit. There is also an emphasis on the state's vital role in America's manufacturing and industry within the Connecticut Collections exhibit. Connecticut was once known for manufacturing of firearms, hardware, tools, and clocks early in its history. Connecticut-made items can be found on display, including canteens, stoneware, teapots, steam irons, and much more. The museum has a collection of more than Connecticut-made vintage toasters made by companies such as G.E. and Landers, Frary and Clark. Products include those made by Colt, Winchester, Stanley, Terry, Whitney, and several other Connecticut inventors and manufacturers. In 1911, The Connecticut State Library received a vast collection of currency, coins, and medals from Joseph C. Mitchelson. Mitchelson was a member of the United States Assay Commission and was the first American to be elected to the British Numismatic Society. The Museum of Connecticut History 's Joseph C. Mitchelson coin collection is considered to be one of the world's best American coin collections. The coin collection contains choice specimens of every minted coin in the United States, including trial pieces and patterns. The American coins on display date back to the 17th century and contains coins from all the way to the present. Among the coins are several rarities, such as the ultra high relief 1907 $20 Gold Double Eagle and Connecticut's 18th century Higley copper token. The coins on display are just a sample of the museum's entire Mitchelson Coin Collection. The collection originally was made up of more than 10,000 United States and foreign coins, and continues to grow. It now contains some of the most unique and rare coin specimens in the world. The name Colonel Samuel Colt is possibly the most recognizable name throughout the history of American firearm development. His genius marketing and inventing aided Connecticut in becoming a major firearms manufacturing center during the 19th century and 20th century. The revolvers and several other firearms that were made by the Colt Patent Firearms Manufacturing Company in Hartford played a significant part in many historic events, not only in the United States, but also around the world. The Colt collection was given to the Museum of Connecticut History in 1957, and is considered to be among the finest collections of early Colt prototypes, experimental firearms, and factory models in the world. Among the firearms on display are Colt-made shotguns, automatic weapons, and Gattling guns. The original "Rampant Colt" statue that once was located at the Colt Factory in Hartford was obtained by the museum in 1995. The Colt Firearms Collection, along with historic photographs and other related items, is a "must-see" for not just firearms enthusiasts, but for American history enthusiasts and students as well. The Freedom Trail Quilt project, as well as the quilts on display in the Museum of Connecticut History, represent the great significance of the Freedom Trail story within Connecticut's history and the nation's history. The project is an acknowledgment by both public and private groups of this significance. The Connecticut in World War I exhibition displays the effects of World War I, both in France and on the homefront from 1917 to 1919. During the war, the U.S.S. Connecticut battleship remained in its home waters in York River, Virginia. Over 1,000 trainees of gun crews for merchant ships and midshipmen participated in exercises aboard the U.S.S. Connecticut while the battleship sailed off the Virginia Capes and throughout the Chesapeake Bay. The U.S.S. Connecticut was assigned to the Cruiser and Transport Command and brought troops home from Europe during the first half of 1919. The Museum of Connecticut History offers two educational outreach programs that are presented in classrooms of schools: Connecticut Invents! and A Connecticut Sampler. Both of these programs bring the stories of Connecticut's history to life through interactive, hands-on exploration and activities. Connecticut Invents! Focuses on both famous and not so famous Connecticut inventors and their inventions. The education program is tailored towards upper elementary and middle school students. Connecticut Invents! Is designed to meet several State of Connecticut Department of Education standards in both history and technology education. Students will learn about several different inventors and inventions that have come from Connecticut. They will also have the opportunity to become inventors themselves through hands-on activities. A Connecticut Sampler explores Connecticut's industrial, military, and political history through hands-on activities, objects, and role play. The program is designed for students in third grade and above. Students will have the chance to learn about famous Connecticut inventors and inventions, relive the legend of the Charter Oak through role play, and find out about the role of Connecticut soldiers in the defense of the United States from the American Revolution to the present. A Connecticut Sampler also teaches students about local Connecticut history, state symbols, and state nicknames.